I've just spent a few very pleasant days south of Sydney at Gerroa. We hired a house on a hill looking out over the beach and I took a Yaesu FT-817 and a slightly modified MFJ random wire tuner along for fun (all I did was add banana sockets for attaching a wire to it). I strung out about 20m of wire from the balcony to a piece of wood in the yard and it tuned up nicely on 80m, 40m, and 20m. Had a few contacts running just 2.5W (on the in-built rechargeable batteries). 80m is blotted with interference at home. At this location it was magnificently quiet until about 5:30pm when bad televisions get turned on. 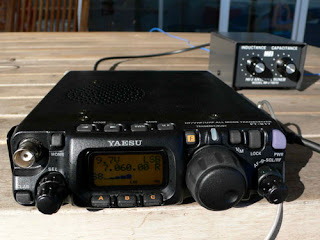 I really want to find a location with no noisy power lines or TV sets to disturb by HF listening. Only a few contacts, mostly listening. Just before we packed up I tuned around on 2m and found a very active local community. Spent the time reading the ARRL Handbook, 2007 and a book by Melvyn Bragg, both really dense and fascinating. On our last morning, went for a walk with my wife who slipped on a ramp and broke her leg. So quick, so easy. My thanks go out to the good folks of Gerroa who helped us to a car, a doctor and a hospital. It's amazing how easily we can be injured. Such fragile creatures.